Last week I did a talk at the AIEA Turin Chapter on Software Security in Practice. 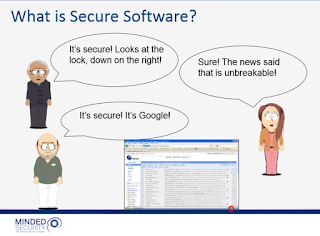 - What is Secure Software? - How can a Company manages the security of the applications today? - How can OWASP support the Enterprises to develop, maintain and buy Software ever more secure? - What is a structured approach to the Governance of Software Security? I do a summary of the basic principles of software security and how OWASP can help to create a structured approach to the Governance of Software Security. 1) If you do not ask for security, no one will develop "secure software". 2) If you do not know the application threats, you will develop unsecure software. 3) Vulnerabilities in the software development process are expected. 4) The fixing process is the most important step of the process of software security. 5) Software Security Governance is the key to have a mature SDLC. - Use the OWASP SAMM to assess your maturity and to build an Application Security Program to manage the SDLC. At the end of the presentation I show how the Companies are approaching Software Security today in the real world using OWASP SAMM and BSIMM 6.